Spurs took the game to penalties but misses from Dier and Lucas Moura saw Spurs crash out. Chelsea have reached the Carabao Cup final after beating Tottenham Hotspur on penalties. N'Golo Kante and Eden Hazard put the Blues ahead in the first half but Fernando Llorente drew Spurs level on aggregate to take the game to extra time. However, the home side prevailed on penalties after Eric Dier and Lucas Moura both missed their spot-kicks and David Luiz converted to send them to Wembley. Fireworks and a light display were put on by Chelsea as the players were making their way out of the tunnel in an attempt to set the tone. However, both sets of fans and players, for that matter do not need a pre-match show to demonstrate what this fixture is about. Eric Dier showed his eagerness to assert Spurs' authority on the game but in turn conceded two free-kicks within the space of two minutes. The Blues were enjoying the lions share of possession, creating the odd half chance but in the majority of cases being fouled before they had the chance to cut Spurs open. Stop and start was the pattern of the opening 20 minutes with both sides showing a lack of discipline in committing 'professional fouls' - Eric Dier being the main culprit. N'Golo Kante drilled the home side ahead on the night after his effort from outside the box flew through the legs of a few Spurs players including goalkeeper Paulo Gazzaniga. It had summed up Tottenham's sloppy start to the game. The Frenchman's strike from the edge of the box somehow found it's way through the legs of three Tottenham players and into the net. It took Chelsea just 10 minutes to double their lead and it was Eden Hazard to silence his doubters. The Belgian has come under criticism from his own manager in the past few days and it was the perfect response from the 28-year-old who was able to poke home César Azpilicueta's cross. It was nothing less than the Blues deserved after a half of dominating the depleted Spurs side. Tottenham were unable to stamp any authority on the game with nothing up top to offer them an outlet when they got a small relief from the Chelsea onslaught. Within the first five minutes of the second half, Spurs drew level on aggregate through Fernando Llorente. Mauricio Pochettino must have had some stern words towards the Spaniard who was able to get goal side of David Luiz and nod home Danny Rose's superb cross. A sensational start to the half for the striker who was in desperate need of a goal to boost his confidence which was through the floor. Frustration seemed to be getting to the Chelsea players as they began to let their heads go following the Llorente goal. Despite drawing level on aggregate, chances were coming few and far between. However, Llorente squandered another golden opportunity after missing the ball completely inside the box. The Spaniard was quickly replaced by Lucas Moura. Hazard squandered a clear chance on goal as his shot whistled wide of the post - an effort which you would expect the Belgian to slot away with ease. Spurs were holding strong, dealing relatively well with Chelsea's attacking threats. But both sides needed another goal to avoid the game going to penalties. 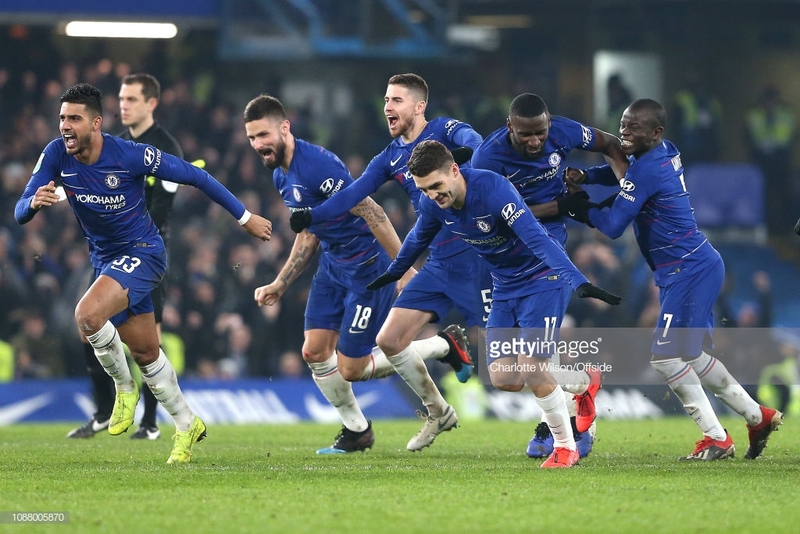 Chelsea pressed for the winner in the dying seconds, Olivier Giroud of all people missed a last-second header from inside the box for and it proved a crucial miss. Christian Eriksen and Erik Lamela were the first to step up for Spurs and both slotted the ball home which Chelsea replied in style. Eric Dier and Lucas Moura missed their penalties and allowed David Luiz the opportunity to send Chelsea to Wembley. The Brazilian made no mistake in getting the better of Gazzaniga and the Chelsea celebrations began. Llorente showing he has some worth? On the whole, it was another poor performance from Fernando Llorente, however, the Spaniard gave Spurs the goal which saw the Lilywhites draw level on aggregate. The 33-year-old missed two great chances and could have put Spurs through but a lack on composure cost the experienced striker. With Lucas Moura now back fit, it will be interesting to see if he continues to start up top. Two very poor penalties from Dier and Moura allowed Chelsea the opportunity to seal the win and both Jorginho and Luiz made no mistake in their spot kicks. With the prospect of the final at stake, Luiz calmly stepped up and slammed the ball home. Despite Spurs' best efforts, Chelsea deserved the victory over the two legs having dominated the game at Wembley and then the opening half at Stamford Bridge. Spurs have failed to reach the final, however, there was a lot of character shown in the second half. At the end of the first 45-minutes, the Lilywhites looked exhausted and levels off Chelsea. However, Pochettino's men managed to work their game back into the game and considering some of their main men were out through injuries it was a valiant effort. After being publically criticised by his own manager, Hazard stepped up and certainly delivered on the night. His goal proved vital but his performance, in general, was superb. It was Hazard back to his best, proving unplayable at times the only way Spurs could deal with him was to foul him.